It’s not just young people and the 23½ million single Baby Boomers using online dating, more than five million people over 55 have used online dating as well. Instead of dating being largely limited to coworkers, people in common organizations, bars, and introductions from friends and family, online dating casts a huge net that greatly enhances your ability to find exactly the kind of person you are looking for. Online dating psychologist Dr. Jim Houran helps us learn how to meet Mr. or Ms Right and reduce the chances of getting burned-or even flamed. To summarize Dr. Jim Houran’s advice, novices probably do best by starting with large free sites like PlentyofFish.com to get a feel for online dating. With that feel, they may want to move on to niche sites. The biggest mistake people make is not investing the time and effort in well thought out postings and engaging photographs. The other big mistake people often make is not being clear about who they are and what they are looking for. It’s not magic, it’s a process of increasing the odds of success. I especially liked the idea that it isn’t necessarily the most glamorous photo, but often the most friendly and approachable photo that gets the click. On similarity and compatibility, it appears that similarity helps with religion, values, and perhaps politics, and is somewhat important for education and intelligence. When it comes to personality, however, it is hard to predict what works. Finally, Dr. Houran suggested that rather than just matching for similarities, as eharmony.com does, the most sophisticated online dating is assessing and coaching. I.e., assessments give suggestions on where and how to look and how to present yourself. Of course, this runs the risk of the advice being self-serving for paid services as opposed to objective advice that is in your best interest. 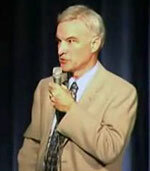 Dr. James Houran is a columnist for onlinedatingmagazine.com where he has several dozen articles. Rather than the usual off the cuff advice, Dr. Houran’s columns are solidly based in research and even footnote sources. His Office Hours with Dr. Jim column are at www.onlinedatingmagazine.com Dr. Houran also is President of 20│20 skills, a company that does assessments and training for service industry businesses. Dr. Houran’s “Office Hours with Dr. Jim” column are on www.OnlineDatingMagazine.com. His consulting business is at www.2020skills.com. Dr. Brickey’s other websites are www.DrBrickey.com and www.Anti-Aging-Speaker.com.